Soft breezes blow carrying the sweet scent of flowers through the air, while the summer sunshine fills your heart with warmth! There’s no grander place to leave your cares and worries behind than a beautiful garden! It’s the perfect place to lose yourself in a day dream as you’re surrounded by bountiful blooms playing host to a kaleidoscope of butterflies! What is it about butterflies that evoke so many feelings of joy, memories of loved ones gone before us, and the gentle reminder that the trials of life can transform us into something beautiful! Join us in celebrating the beauty of life with the new Butterfly Dreams Collection by Heartfelt Creations! Lose yourself in a bright and happy hued paper collection filled with vivid pinks, blazing oranges, soft blues and soothing teals, boasting dynamic imagery of beautifully illustrated butterflies and divine florals encompassed in whimsical swirls and beautiful brocades! 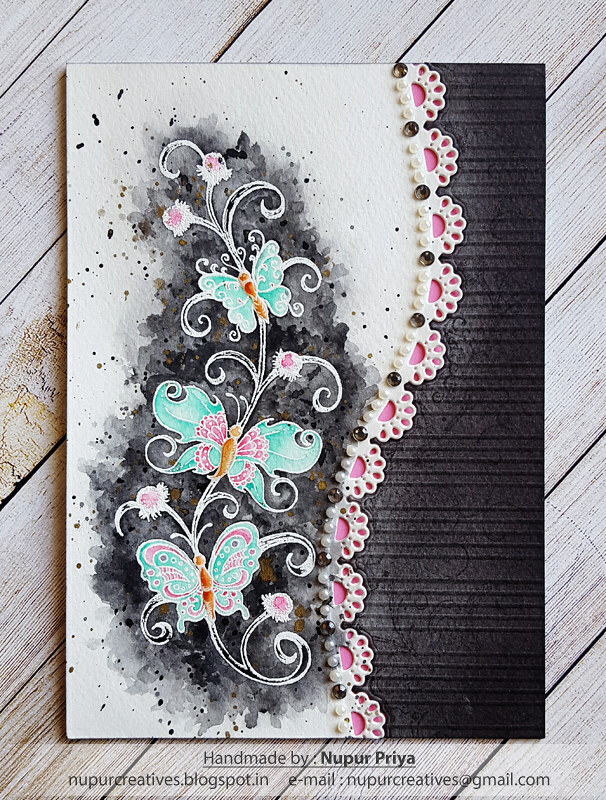 Several sizes of artfully illustrated premade card fronts, and elegant scrapbook pages set the perfect scene for hand shaped and embellished butterflies, along with your favorite dimensional flowers! Three fanciful cling stamp sets with coordinating dies lend themselves perfectly to adding a touch of elegance and grace to your one of a kind paper creations with delightfully scripted sentiments, stylish butterfly borders, detailed decorative dies, and several fascinating butterfly illustrations! So close your eyes, allow yourself to relax, and come along with us as we escape to a place filled with Butterfly Dreams! 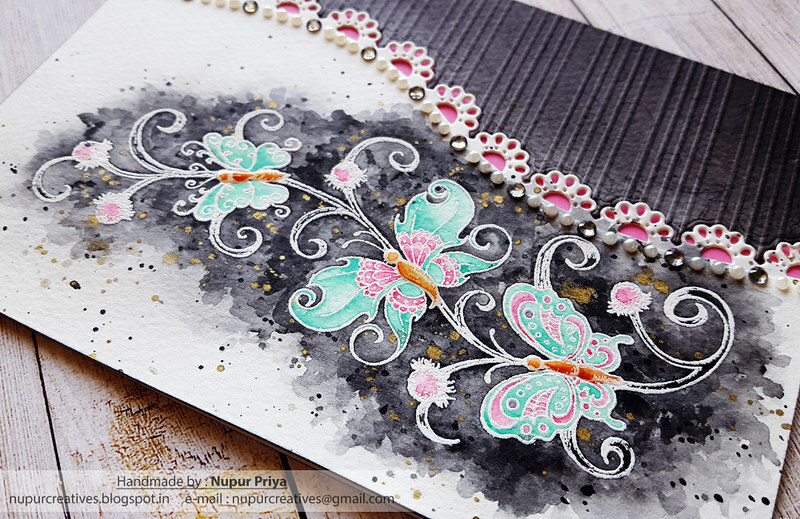 Black Soot Distress Ink, Picked Raspberry Distress Oxide Ink, Versamark Ink, Gansai Tambi Watercolors, paint brush, masking paper, watercolor cardstock, rhinestones & pearls. Take a 5" x 7" white cardbase & ink it using Picked Raspberry Distress Oxide Ink & Stack and Store Daubers so that it covers the open are of the border die cut in the previous step. Glue down both the pieces of watercolor cardstock.as shown. Add some pearls & rhinestones to the die cut border & Crystal Lacquer to the body of the butterflies to add finishing touch.